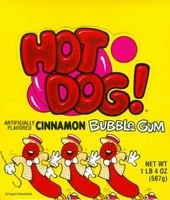 Hot Dog Gum is a cinnamon flavored bubble gum shaped just like a hot dog. You get 2 pieces of hot dog gum per pack, 72 packs of cinnamon gum in each box for a total of 144 pieces of hot dog bubble gum. If you enjoy the spicy taste of cinnamon then the hot dog gum is perfect for you. These are a favorite old time gum and somewhat hard to find locally. Old Fashioned Hard Cinnamon Candy From Claeys 6oz.